Now the climate in winter around all over the world and every one feels hungry and crave for some hot spicy and also crunchy food at the evening. The evening snacks generally we consume are deep fried ones. We could make these fried snacks too healthy by adding some greens in it. 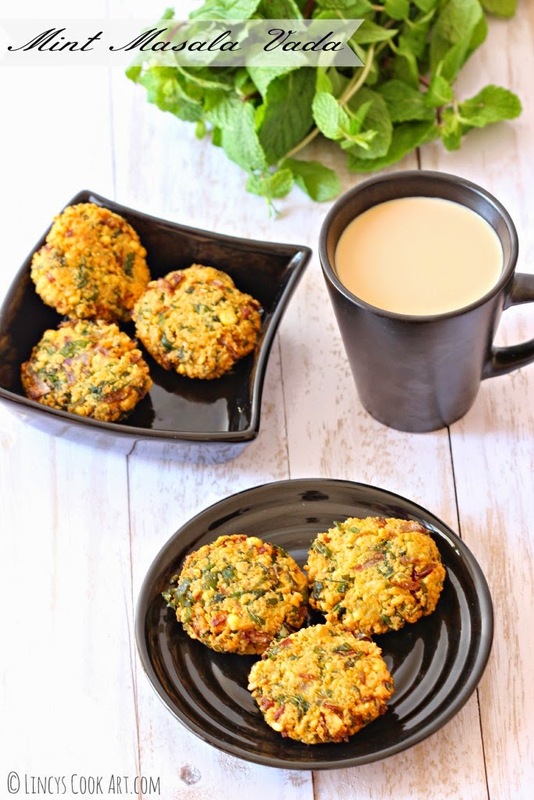 One such recipe i have shared with you last year the Spinach masala vadas. This year i have come up with a tasty and flavourful mouthwatering vada to fulfill your hunger. Mint has many health benefits and dhal is rich in protein. So it is a filling healthy snack perfectly suits to this climate. Soak the channa dhal in a bowl with enough water to soak for about 2 hours. Finely chop the mint leaves and set aside. Drain the water well and transfer this soaked dhal on to a blender jar. Pulse the mixture three to five times in a blender jar, scrapping the edges in between each pulse to get a coarse dhal mixture. In a bowl add the chopped mint leaves, onion, green chillies, ginger, fennel seeds, jeera, asafetida, salt, a teaspoon of oil and the ground dhal mixture. Mix well with hand to evenly mix all the ingredients. Take a gooseberry sized mixture and pat and shape inside the left hand using right hand fingers. Heat oil in a deep pan till hot and drop the shaped vadas one by one and fry till golden and crisp. Drain the fried vada from oil and keep on top a kitchen towel to absorb excess oil. Notes: Add a pinch of baking powder to get a crispy vadas, to keep the crispiness lasts for hours.